Joe Jack Talcum is the guitarist/co-lead vocalist of the Philly punk band The Dead Milkmen. They are remembered for songs like "Bitchin' Camaro" and the MTV hit "Punk Rock Girl" among others. He was also in the band The Low Budgets that released 3 cd's in the early 2000's. Joe performs quite often solo/acoustic having released many solo recordings. 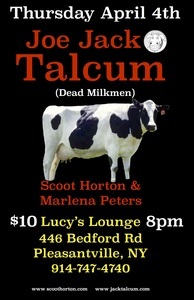 Scoot Horton and Marlena Peters will be opening for Joe Jack Talcum. Scoot and Marlena will be playing their mixture of alt country, cow punk, and pop. Scoot still wears his punk influences on his sleeve. This is a rare chance to catch Joe Jack Talcum in Westchester County, NY.